I appreciate the tips you've posted here. So many times I have brought home a tea cup only to discover a flaw I had not noticed when I bought it.I might have still bought the teacup, but maybe not been willing to pay so high a price for flawed china.You're so right though, sometimes a piece just captures my heart and I have to own it! Love those teacups - imperfections and all, Terri! I have had it happen to me before too and it is so disappointing. But a little flaw here or there is nothing compared to getting an expensive teacup or teapot in pieces en route. It makes me cry every single time. Well it's only happened a few times, horribly packed - ugh omg- but it is horrifying when it does happen! 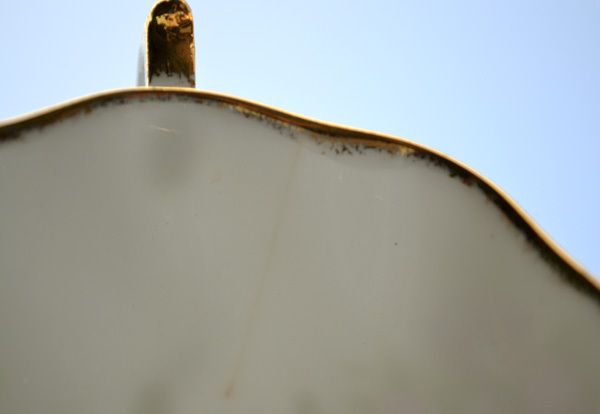 Terri, your teacups are all so beautiful....even with their little imperfections. Thanks for the wonderful and helpful tips! What's worse is buying on line. Most of the on line buys I make are pick up only so I always request that I look before I commit. There have been some doozies! Indeed it is precisely this: we disposal all the possible investigations and then we buy in any case, although chips, crooked handles, and trademarks of doubtful provenance! I imagine you, to twist yourself sleepless in bed, haunted by a tea cup and saucer ... is the same for me! I bought all my cups at auction, so I fully understand the concept of initial budget (which is constantly exceeded! ), and bad surprises ... But there is to say that if you find reliable sellers, the risks are lower, even buying online, and sometimes the surprises are nice, because you open the box and find a treasure more precious than you waiting for. Thanks for all your advice, they are really appreciated. Excellent post today. I have to use those kind of tips when I buy for my shop! 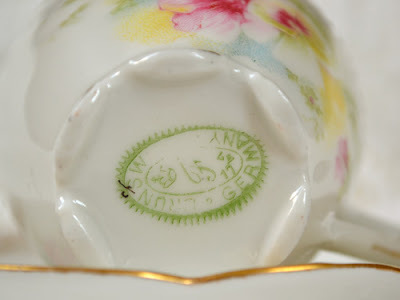 Shelley tea cups are always the most expensive, good ones or bad. But they are so pretty. Wonderful pointers for beginner collectors. 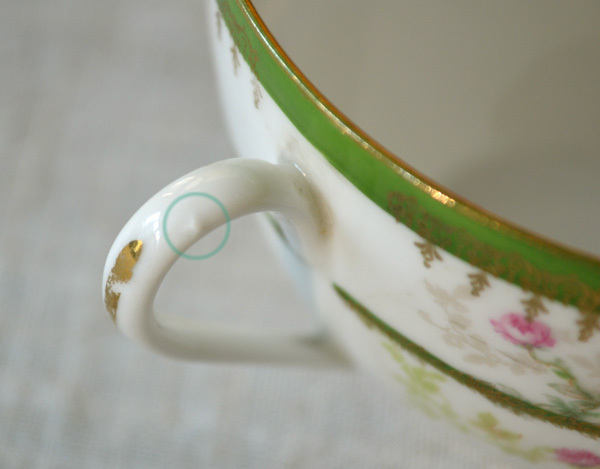 All of your antique teacups are lovely and the little imperfections add character. Very informative post Terri.Thank you for sharing. Have a nice day. What a wealth of information you have shared with us. I never buy cups online. Maybe that is why my collection isn't overly big. I do like to see something and hold it first before I buy it. 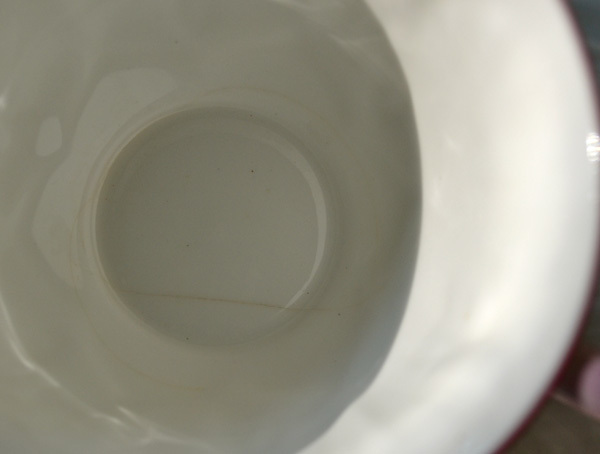 I bought a sugar bowl once online and the cover was cracked, not happy! Thank you for sharing your knowledge and tips; very helpful. You certainly shared some relevant tips for china collectors, which I loved reading! As my favourites are antique cups, I don't usually mind if they aren't in mint condition, especially if they are a good maker and the price is good! ;)Your cups are beautiful! 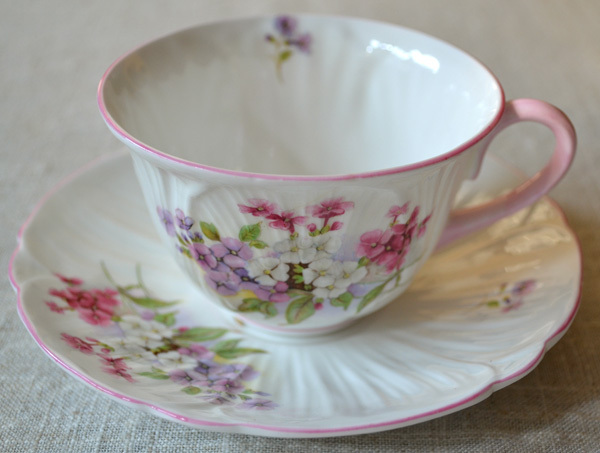 Such a pretty cup and saucer set but sadly not quite as perfect as you thought! I have so enjoyed this post with all the most wonderful tips in what to look out for - thank you for sharing all that with us - so helpful. I would dearly love to come and join in one of these days when I am less busy but I love to come and admire! Thanks for all the great wisdom in choosing a teaset. I am very new at this and would also like to know WHERE to find some of the awesome sets that most of you have. All are so beautiful and I am very much enjoying tea time and learning that tea is very important in a life. I have noticed that Martha did not post for this weeks tea time. I missed seeing her this week. I do hope that she is in good health and that we will see her next week. Love the tips. Great idea and tips. Thanks for all the tips, Terri. I don't mind a small flaw if I'm in love with the cup ... I figure it really fits me ... flawed I am!!! :D :D Happy Tea Day! What a lovely, informative post, dear Terri! I've begun collecting (again) as my girls and their friends have struck a new interest in tea parties. This information is helpful and much appreciated! Interesting criteria. Perfection? Alas, I buy chipped and cracked and faded and patched, but then I only buy at estate sales and if I think they're simply beautiful. I never use them other than for looks. My favorites are all pre 20th century. One local friend plants hens into her not-so-perfect tea cups and they are adorable adorning her yard here and there. I wanted to enter but I don't have a blog... don't care to have one. Enjoyed todays Teacup Tuesday. 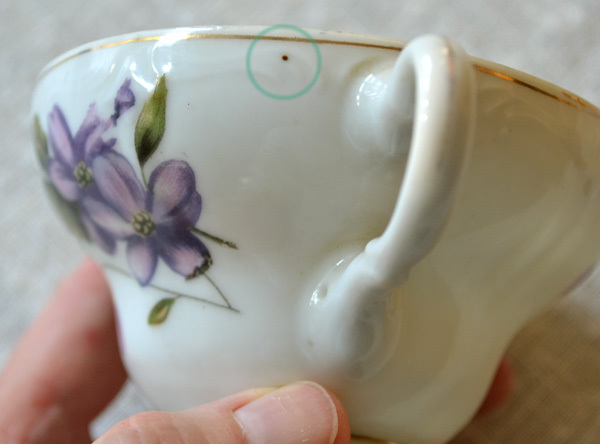 Terri - I am totally printing out this little tutorial on teacup buying. You have taught me sooo much - and I am keeping my eyes peeled for one of those nifty identification catalogs you found at a yard sale! I love history so knowing a little more about a piece for me is golden - but mostly the info I find online when I google the backstamp is nothing but EBay! Anyway - thanks for the tips. I must say, teacups need to speak to me, too. And, I have paid a bit too much for a well loved piece on occasion. But, aren't the deals the best! Hi Terri...I need to do some corrections of your info. Much that you say is dependent on county of origin, material and age. 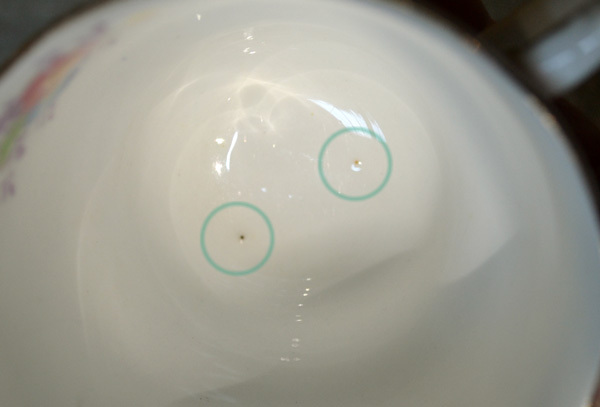 The black spots are kiln dust or mineral deposits and are quite normal in 19th century early bone china and porcelain and is not really a flaw. 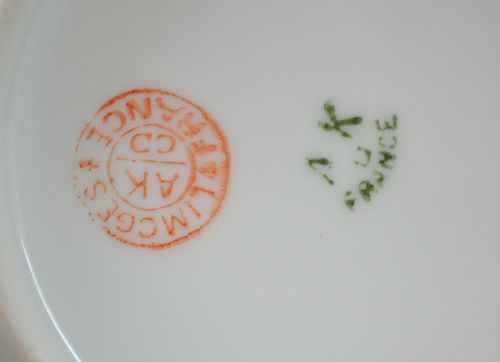 In some cases, even the best manufacturers like Minton(s), Copeland and Spode had these normally. The same for bumps under the glaze. Foreign manufacturers are also more likely to have that. The "ring" of hitting it with your finger is actually better with a pencil, but doesn't work at all on a lot of shapes...including Shelley Gainsborough, many pedestal cups and other specific shapes. Occasionally there are black or paint spots that look like flaws on hand painted items but on looking closer you see that they were done by the artist during the decorating and aren't flaws. A lot of good starter points though! I have gotten teacups and missed hairlines as well...very disappointing! I always learn so much from you Terri. This cup is such a pretty one, even with it's imperfection. Thanks so much, Terri, for the lesson! I appreciate it! I had no idea how to judge the merits of a cup and saucer having never collected them. But I love to learn new things and it will be fun when I go to a flea market or even an estate sale and look at cups and saucers, I will know what to look for. We're never too old to learn, right? I know you agree with that! By the way, that first cup with the pink rim, I'm in love with it. It's the pink rim that did it! It's gorgeous! Lots of good info here. Lovely cup! Thank you for hosting! your tipps are really helpful for building a real collection. A collection start often unnoticed. You get one piece, find another nice and somebody make you a gift: a collection is born. Sometime we make mistakes with the first pieces and buy them much too expensive. All the little ponts, nubbles and damages must reduce the price. Otherwise one will feel sorry in the end. But your cups are beauties and I think you enjoy them, even when they have a little flaw. They are ancient collectibles and I always love to see them. Thank you for the helpful informations and for hosting this wonderful party. Thank you for sharing such good tips on purchasing a tea cup! Sometimes I miss a little crack or blemish, but I don't usually mind. I'm just happy to rescue the poor piece from going in the trash. 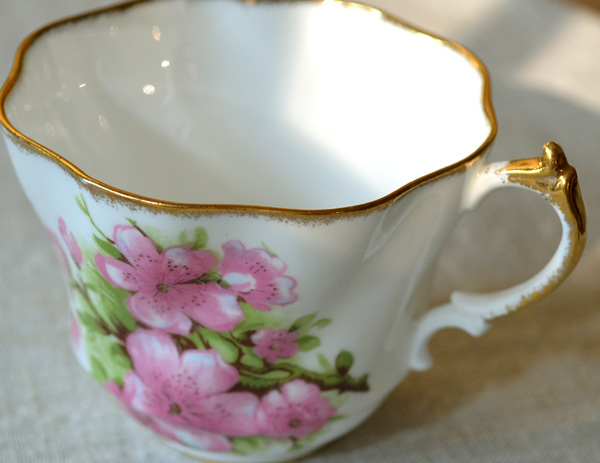 Love the cup as it is so dainty and feminine! 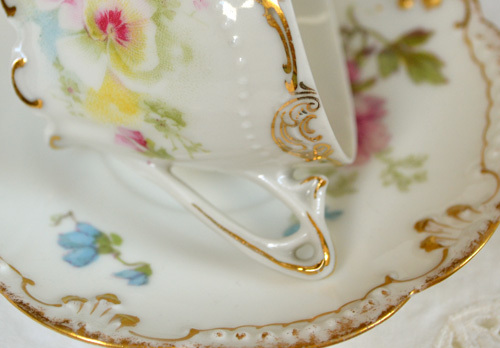 Thank you so much for posting about what to look for when buying used teacups. I'm in the mood for more teacups and am on the hunt! Thanks for hosting your lovely party and making Tuesday a special day of the week. This is wonderful information! I had not thought to do all these things - my heart goes way before any common sense! I'll feel like an intelligent shopper next time! Thanks for sharing your knowledge & skills on purchasing teacups. I found it very helpful as I am new at collecting but really enjoy the thrill of the finding beautiful teacups at great prices. Your teacup is very pretty. I never thought of checking for wobbling teacups. I have examined them for hairline cracks. Thanks again for sharing. Have a wonderful weekend. Thanks so much for the tips! I have bought a cup or two that had a hairline crack, but I paid so little for them and loved the pattern, so I got them anyway. These are good things to know, though. Thanks! 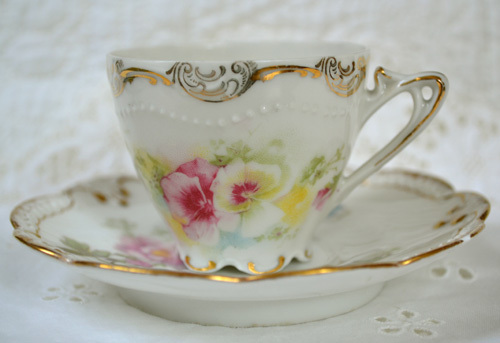 Wonderful and pretty cups..gorgeous..and fabulous informative post...you are awesome Terri!